Carbon 49, 49-Key MIDI Keyboard from Samson Technologies. 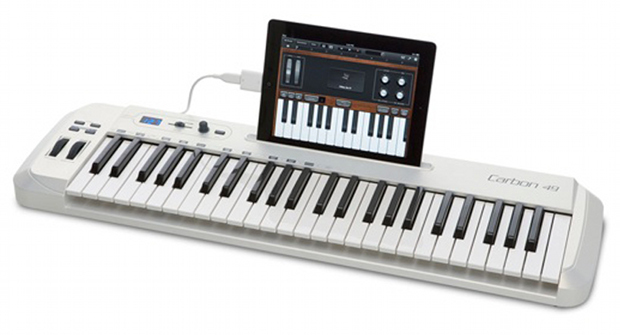 The Samson Carbon 49 is a new 49-key MIDI keyboard, most notably featuring a slot to insert an iPad for use with mobile software. The keyboard, while serving some functions excellently, is lacking in other areas that make the keyboard a perfect fit for some while not at all what others need. First of all, the keyboard is the expected size comparable to main competitor M-Audio Keystation 49, though the iPad slot on the far front side seems to distend the end somewhat. At around 6 pounds, the keyboard is easy enough to transport but a little uncomfortable for lap play, which slightly counteracts the bonus of the iPad slot. The machine's powering is a bit strange--it draws power from a USB type B interface, but when used at a high keystroke frequency with an iPad (which it must draw power from with the Apple Camera Kit) the user is occasionally met with a sound-stopping "insufficent power" message, throwing a kink into some high intensity pieces. While the keyboard does contain a dedicated MIDI out, it still must be receiving power through the USB port to send through it, making control of non-USB controllable devices a bit awkward to power. MIDI mapping is somewhat difficult and requires a thorough read of the manual, and quite a bit of menu-diving is necessary to achieve the desired results. The keyboard itself plays fairly well, with semi-weighted keys that occasionally feel too quick or too slow on the return when playing intense, slow, or pieces with lots of note sustain. The 1/4" input jack for sustain and expression pedals function well, and the pitch bend and modulation wheels are surprisingly well-built. The volume slider and data knob, while a bit unpleasant to tweak, they are built very sturdily. The standard octave control is accompanied by a useful semitone transpose control, and both have light-up buttons. The octave or transpose range is displayed on the three-digit LED, and the other MIDI controls have their value (from 0 to 127) displayed on this when tweaked. While the Samson Carbon 49 fulfills its job as a basic DAW keyboard, it has a few trip ups when used with its iPad function that makes it feel overloaded and underprepared. 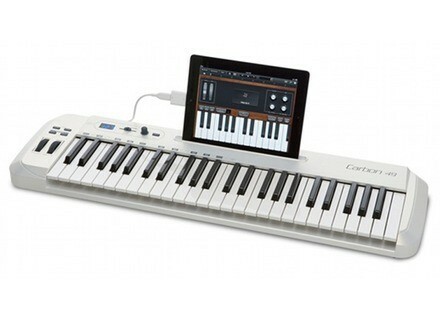 Still, it is available at a very reasonable price and useful for people looking for an entry-level MIDI keyboard with iPad and external MIDI support. 3/5.